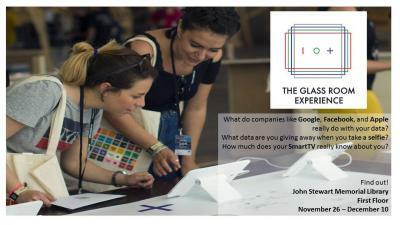 The John Stewart Memorial Library (JSML) at Wilson College will host the Glass Room Experience - a portable, pop-up exhibition on data and privacy - throug h Dec. 10. The exhibition, which uses art objects to raise awareness about technology and its impact on our lives, is free and open to the public. Described as an art exhibit, learning experience and powerful statement on the role of technology in our daily lives, the Glass Room uses art objects to make issues involving online privacy and data collection accessible and tangible. "See what scale of the company behind the platform you use every day, understand what data can be gleaned from your selfie, and figure out what you're agreeing to with the privacy policies you rarely read," according to the Tactical Technology website, which further describes the Glass Room as "an immersive ‘tech store with a twist’ that disrupts our relationship with technology and encourages visitors to make informed choices about their online life." Visitors can check out the exhibition on the first floor of the library during normal operating hours. The JSML is open Mondays through Thursdays from 7:45 a.m. to 11 p.m., Fridays from 7:45 a.m. to 5 p.m., Saturdays from 9 a.m. to 5 p.m. and Sundays from 1 to 11 p.m.
More than 60,000 visitors have visited the Glass Room exhibitions around the world. For more information about the exhibition, visit theglassroom.org.